The Tui (Prosthemadera novaeseelandiae) is an endemic passerine bird of New Zealand. It is one of the largest members of the diverse honeyeater family. The name tui is from the Maori language name tūī and is the species’ formal common name. The plural is tui in modern English, or ngā tūī in Māori usage. Some speakers still use the ‘-s’ suffix to produce the Anglicised form tuis to indicate plurality; however, this practice is becoming less common. The early European colonists called it the Parson Bird, but, as with many New Zealand birds, the Maori name tui is now the common name and the english term is archaic. At first glance the bird appears completely black except for a small tuft of white feathers at its neck and a small white wing patch, causing it to resemble a parson in clerical attire. On closer inspection (see image) it can be seen that tui have brown feathers on the back and flanks, a multicoloured iridescent sheen that varies with the angle from which the light strikes them, and a dusting of small, white-shafted feathers on the back and sides of the neck that produce a lacy collar. Tui are found through much of New Zealand, particularly the North Island, the west and south coasts of the South Island, Stewart Island/Rakiura and the Chatham Islands—where an endangered sub-species particular to these islands exists. Other populations live on Raoul Island in the Kermadecs, and in the Auckland Islands (where, with the New Zealand Bellbird, it is the most southerly species of honeyeater). Populations have declined considerably sinceEuropean settlement, mainly as a result of widespread habitat destruction and predation by mammalian invasive species. Nonetheless, the species is considered secure and has made recoveries in some areas, particularly after removal of livestock has allowed vegetation to recover. Predation by introduced species remains a threat, particularly stoats, theCommon Myna (which compete with tui for food and sometimes takes eggs), and rats. Tui prefer broadleaf forests below 1500 metres, but will tolerate quite small remnant patches, regrowth, exotic plantations and well-vegetated suburbs. They are one of the most common birds found in urban Wellington. They are usually seen singly, in pairs, or in small family groups, but will congregate in large numbers at suitable food sources, often in company with silvereyes, Bellbirds (another New Zealand honeyeater), or kererū (New Zealand wood pigeon) in any combination. Generally, when interspecific competition for the same food resources among New Zealand’s three species of honeyeater occurs, there is a hierarchy with the tui at the top, with bellbirds and stitchbirds successively subordinate to the species above them—they are thus frequently chased off by tui at a food source such as a flowering flax plant. Male tui can be extremely aggressive, chasing all other birds (large and small) from their territory with loud flapping and sounds akin to rude human speech. This is especially true of other tui when possession of a favoured feeding tree is impinged. Birds will often erect their body feathers in order to appear larger in an attempt to intimidate a rival. They have even been known to mob harriersand magpies. The powered flight of tui is quite loud as they have developed short wide wings, giving excellent maneuverability in the dense forest they prefer, but requiring rapid flapping. They can be seen to perform a mating display of rising at speed in a vertical climb in clear air, before stalling and dropping into a powered dive, then repeating. Much of this behaviour is more notable during the breeding season of early spring—September and October. Females alone build nests of twigs, grasses and mosses. Nectar is the normal diet but fruit and insects are frequently eaten, and pollen and seeds more occasionally. Particularly popular is the New Zealand flax, whose nectar sometimes ferments, resulting in the tui flying in a fashion that suggests that they might be drunk. They are the main pollinators of flax, kowhai, kaka beak and some other plants. Note that the flowers of the three plants mentioned are similar in shape to the tui’s beak—a vivid example of mutualistic coevolution. Tui are considered to be very intelligent, much like parrots. They also resemble parrots in their ability to clearly imitate human speech, and were trained by Māori to replicate complex speech. 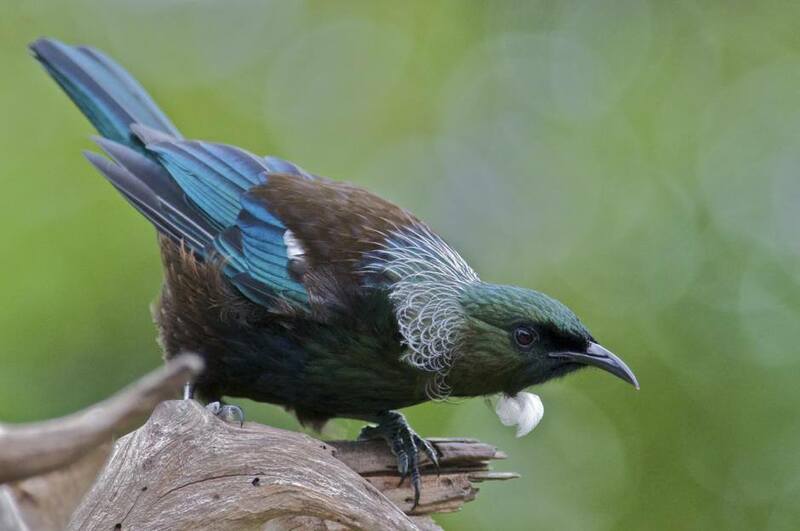 Tui are also known for their noisy, unusual call, different for each individual, that combine bellbird-like notes with clicks, cackles, timber-like creaks and groans, and wheezing sounds. Songbirds have two voice boxes and this is what enables them to perform such a myriad of vocalisations. Tui song also exhibits geographical, microgeographic, seasonal, gender and individual variation. Some of the wide range of tui sounds are beyond the human register. Watching a tui sing, one can observe gaps in the sound when the beak is agape and throat tufts throbbing. However, ongoing research has so far failed to detect ultrasound within tui vocalisations. Tui will also sing at night, especially around the full moon period.